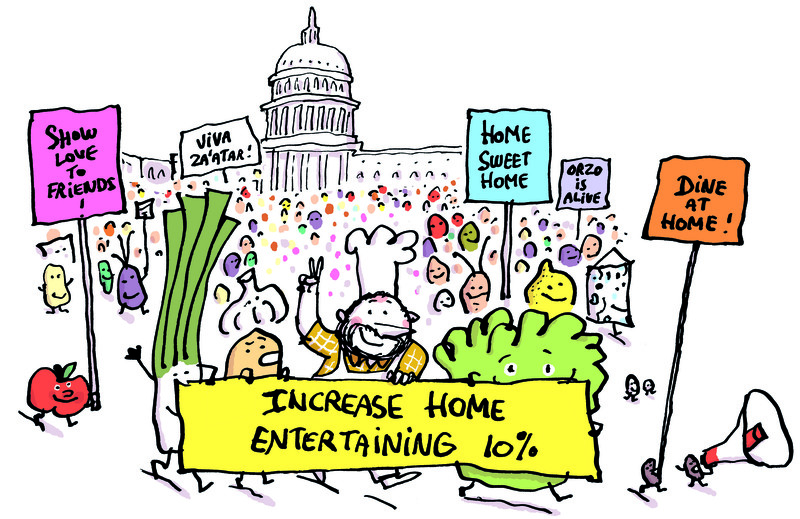 If you are a regular here, you know that I have a mission to increase home entertaining nationally by 10%. Really. If you are new to my blog, now you know about my mission. Cynics kid me about the 10%. They ask, “Why 10%?” or, with a touch of sarcasm, “How will you know you have accomplished your mission?” My response is that I believe in setting expansive goals. President Obama would call them audacious. Ten percent is a nice round number and actually not so difficult to accomplish. If you normally entertain friends and family in your home once a year and I encourage and inspire you to do it twice a year, that’s a 100% increase in your home entertaining. So, help out! Entertain at home. My recipe for holiday parties has three simple steps. 2. Think about having The Good Enough Holiday Party. Don’t set the bar unrealistically high for yourself. Over-reaching rarely has a happy ending. Either you end up saying, “No, that’s too hard” and skip home entertaining altogether. Or, you try something that’s way beyond your resources — psychic, time and/or money — and at your party’s end you are resentful and swear off future entertaining at home. 3. Whatever you do, spend the upfront time to plan and spread out your tasks over at least one week so you get your one relaxed hour before guests arrive. Plan to entertain this holiday season. Better. Easier. Hanukkah begins Friday evening, December 11th and runs through Saturday evening, December 19th. That gives you two weekend windows to entertain friends and family with latkes. Plan ahead! If you make applesauce this weekend it will hold in your refrigerator up through that last candle in the menorah. Visit your local farm stand or farmer’s market if you can for a mix of fresh sweet and tart apples for your applesauce. (The Reading Terminal — where I am spending weekends with At Home — is loaded with varieties of local apples. Shop, visit and get a signed book…or two or three.) Latkes may be made in advance and frozen. It’s a shame that potato pancakes tend to be made only for Hanukkah, the Jewish holiday that comes in December. The Hanukkah story celebrates the miracle of oil—there was reportedly just enough to burn one day in the temple, but it lasted for eight days. The fact that potato pancakes require prodigious amounts of oil to fry is surely a coincidence. The key to making them crispy is to squeeze out excess water from the grated onion and potato. Make the applesauce first so it’s ready for your hot latkes. The recipe will yield more than you will likely need for the latkes. do ahead Applesauce may be made up to two weeks ahead and stored in the refrigerator. Latkes may be made up to three days ahead and stored, tightly wrapped, in the refrigerator or frozen up to a month. Reheat in a 350° oven for 7-10 minutes, turning them over midway through. 1 Make the applesauce: In a large pot, add apple cider and cinnamon sticks and simmer slowly for 10 minutes, taking care not to boil the cider away. 2 Leaving skin on, core apples and cut them into chunks. 3 Add apples and sugar to pot. Increase heat to high and cover. After about 5 minutes, stir apples to move the top apples down into the liquid. Continue cooking until apples are soft and falling apart, about 10-15 minutes more. 5 Make the latkes: On the largest holes of a box grater, grate onion and potatoes. The large-holed grating disk on the food processor does a fine job too. Turn the mixture onto several layers of cheesecloth or an open kitchen towel. Gather the corners and squeeze the water from the mixture. 6 Combine eggs, flour, salt and pepper in large bowl. Add onions and potatoes and mix well. 7 Preheat oven to 200°. Line a baking sheet with two layers of paper towels and have another unlined baking sheet ready. Heat 1⁄2 cup oil in a sauté pan over moderately high heat until very hot but not smoking. Fill a 1⁄3 cup measure with the potato mixture. Drop it into the sauté pan and push it down with the flat side of the measuring cup so you have a pancake about 3 inches in diameter and 1⁄4-inch thick. Cook pancakes until brown and crisp on one side, about 2-3 minutes, and flip, taking care not to splatter the oil. Continue cooking for 1-2 minutes more. Add more oil as needed, making sure to get the oil hot before adding the pancake mixture. Adjust heat as needed so that the pancakes brown as they cook through without burning. As you get to the bottom of the mix it will be watery, so be sure to give it a stir. Transfer cooked pancakes to the prepared baking sheet to drain. Pat the top of the pancakes with another double layer of paper towels. Cook remaining batter in batches until all the pancakes are cooked, transferring cooked and drained pancakes to the unlined baking sheet. 8 Keep them warm in the oven until ready to serve. Serve with applesauce and/or sour cream. Additional note about making latkes in advance: Make sure latkes get cooked through if you are making your latkes in advance. Uncooked potato will discolor. To make sure latkes are cooked through, make sure you cook over moderate heat so that the inside gets cooked before the outside gets over-cooked. To tell the story of At Home, Daily News writer Beth D’Addono created a mini reality show by recruiting a willing, but mildly entertaining-phobic Cara Schneider to work with me. Together we designed a plan for a small dinner party. Over the next several weeks I was Cara’s coach. I could not have wanted a better student. I confess to being a bit nervous at the outset. Would these principles to make home entertaining better and easier work in real time and real life? Read the article to find out or watch the video. At Home by Steve Poses is not available in bookstores, but only online or “live and in-person.” Please stop by one of these places. I would love to inscribe a book to you and everyone on your holiday list who loves or aspires to entertain more — better and easier. I will be at Reading Terminal Market weekends between now and the end of the year. Look for At Home’s table in Center Court across from Meze on Saturday’s and near Spataro’s Cheesesteaks — across from the pig — on Sundays. Beth opened Coopermarket in 1995 and since that time Coopermarket has been an everyday and special event Main Line source for wonderful prepared foods and catering. Beth’s first restaurant job was at The Commissary and she also cooked for me at the 16th Street Bar & Grill. Sara, Beth’s key assistant, worked for me at The Market of The Commissary where she single-handedly introduced Philadelphians to fine cheeses long before fine cheese became a food store staple. I will be visiting with Beth and Sara and signing At Home on Monday, December 14th from 3 to 6 PM. Coopermarket is at 302 Levering Mill Road in Bala Cynwyd. I will be at Weaver’s Way in Mt. Airy on Saturday, December 19th from 11 AM to 2 PM. Weaver’s Way General Manager Glen Bergman is an old friend and former General Manager of The Commissary. Weaver’s Way’s Mt. Airy is located on 559 Carpenter Lane. Some of Pascal’s illustrations are both autobiographical and a public service, of sorts. If you are thinking of opening a restaurant, speak to me first! Today’s preview of Chapter 15 — Starches & Grains is the last of three chapters in our Accompaniments section. Chapter 15 features 21 recipes for starches and grains. I just love accompaniments. Accompaniments offer opportunities to play with both flavors and textures. This recipe is a perfect transitional recipes that includes hearty fall flavors but with its mint, harkens back to summer’s fleeting. Cracked wheat, usually available in health food stores, is similar in texture and appearance to bulgur. Unlike bulgur, which is pre-steamed and dried, cracked wheat consists of uncooked wheat berries that have been cracked into pieces. This pilaf combines the nutty grain with earthy green lentils, sweet onions and carrots, and fragrant mint. do ahead Pilaf can be made up to two days ahead, stored in the refrigerator and reheated, well covered, in a 325° oven for 20-25 minutes. 1 In dry pan over moderate heat, toast cracked wheat until it darkens a little and releases a nutty fragrance, 3-5 minutes. Remove from pan. 2 In a large saucepan over moderate heat, add oil until hot but not smoking. Add onions, carrots and garlic and cook over moderate heat until vegetables have softened and onion is translucent, about 7 minutes. Add toasted cracked wheat and lentils and cook for another minute. Add stock, salt and pepper and cook, covered, for 20 minutes. Remove from heat and allow to sit for 5 minutes. 3 Fluff grains with a fork, and stir in scallions, mint and parsley. superior results, and this is part of the wonderful satisfaction of cooking. Tomorrow: We move on to Section 6: Lighter Meals. This section has two dense chapters beginning the Chapter 16 — Sandwiches & Lighter & Vegetarian Entrées. Less than two weeks left to buy the book — and companion website — and receive a signed, numbered first edition. Note: I will be speaking all about At Home — book and companion website — at the Free Library on Thursday, October 15 beginning at 7:30 PM. Hope to see you there. Today is my brother Fred’s birthday. 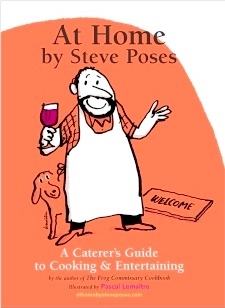 This is a “bottom note” from At Home by Steve Poses: A Caterer’s Guide to Cooking & Entertaining. My brother, Fred, is a very successful corporate executive. Fred helped open Frog, but soon returned to corporate life in New York. We speak regularly by phone and see on another irregularly. Fred’s birthday is September 3. Some years ago, when his family bought a summer house on Long Island, I began cooking on Labor Day weekends for Fred’s family and friends. It’s a birthday gift I can uniquely give, and a chance to try new things for a small and appreciative audience. Highlights from this past summer include: steamed mussels with lemongrass and coconut milk with cellophane noodles; diver scallops with orange essence and basil oil; open-faced sandwich of grilled tuna, fresh herb mayonnaise, pickled red onion, sliced tomatoes and arugula (see page 360); and grilled butterflied leg of lamb marinated in honey, lemon and mint (see page 197). This year things are too busy between the book and website and our starting to operate the daytime food services at The Franklin Institute next week. I look forward to next Labor Day and resuming the tradition. Couscous and Corn Salad has been a Fred’s Birthday regular and has been passed along to Fred’s family to include in their summer entertaining repertoire. Couscous is actually a pasta and not a grain. There are two varieties of couscous. One is Moroccan style couscous, tiny in size and seems much like a grain. The other is Israeli couscous, about the size of pearl barley with a texture much more like pasta. This salad uses the Moroccan style. Do Ahead Couscous and corn salad may be made two or three days ahead. Re-fluff before serving. As with any pasta salad, the pasta absorbs the dressing as it sits. While not required, the salad would benefit from the addition of a touch more lemon juice and olive oil after it sits for a few days. 1. Bring a pot of salted water to a rolling boil. Blanche corn for 2-3 minutes. Immediately stop cooking by running under cold water or plunging into a bowl filed with water and ice. 2. Hold one ear of corn vertically with the blunt stalk-end of corn down. Using a chef’s knife, shave off the kernels moving your blade from top to bottom. Repeat with rest of corn. Next, holding the knife blade perpendicular corn, scrape the cob to remove remnants of corn and extract the “milk.” Reserve. It all goes into the salad. 3. Place couscous in a large bowl. Bring water to a boil. Pour water over couscous and allow to sit as couscous absorbs all the water. Once the water is absorbed, fluff with a fork. This just takes a few minutes. For “extra credit,” make a corn stock by returning the scraped cobs to the water you used to cook the corn, simmer for 10-15 minutes and use this corn stock to cook the couscous. 4. Add to the cooked couscous, corn, onion, scallion, sweet pepper, garlic and cilantro. Mix well. Add lemon juice and mix well again. You want to add the lemon juice and mix before adding olive oil so that the couscous can absorb the lemon juice before being coated with the oil. Add olive oil, salt and pepper and mix again. It’s nice to serve a salad like this in something low rather than a deep bowl. This week’s blog is filled with great recipes to share with friends and family. It’s a good time to suggest they subscribe to the blog to save you the trouble of constantly emailing recipes. In the spirit of Labor Day — less labor for you! We are about four weeks from having books in hand and starting to ship. If you buy your book(s) now, you will receive a signed, limited first edition. More than a great grilled steak, more than soft-shell crabs, more than caviar, I love corn. Recently I have given you recipes for Chilled Corn Soup and Corn and Tomato Salad. Today, it’s fresh Corn Cakes. I’m partial to bi-color corn. White corn is more dependably sweeter, but I prefer the corniness and color of bi-color. The fresher the better. You can use either for this recipe — just keep it fresh. Do ahead It is best to blanch the corn as close to its picking as possible, but once it’s cooked its flavor is set. You can make the batter or actually cook the cakes up to three or four days before serving. Just follow instructions for reheating below. If you make batter in advance and refrigerate, remove from refrigerator at least an hour before cooking to take the chill off. If using cold batter, adjust the cooking temperature a bit to enable to batter to cook through while not over-cooking surface. 1. Blanch corn in a pot of boiling water for about 2 minutes. Remove and immediately run under cold water to stop cooking and cool. 2. With a sharp knife, cut corn from cob. Using the blunt edge of knife, scape corn to remove remaining remnants of kernels and the milky corn residue. Place in large bowl. Add scallion. 3. In a small bowl, beat eggs until well mixed. 4. Add eggs to corn. Mix well. Add flour, baking powder, salt and pepper. Mix well. Depending on the size of your corn, the batter may be too thick or too thin. Hold out a few tablespoons of flour and add as needed. Batter should be thick and hold its shape on a spoon. 5. Add about 3 tablespoons vegetable oil to medium saute pan over moderate heat. You want a generous amount of oil such that when you put in cakes, oil comes up the sides slightly, but cakes are not swimming in oil. Cook cake in batches. For a medium-sized corn cake — about 3″ diameter — add a heaping tablespoon batter to the oil, pressing lightly to flatten and distribute. When bottom is lightly browned and cake modestly firm, carefully flip and continue cooking until second side is lightly browned. Set aside until all batter used. 6. You can re-heat cakes two ways. Simplest is to preheat oven to 350 degrees, place cakes in a single layer and heat for 7-10 minutes until hot. Better is to quickly grill cakes in a dry, hot grill pan or over moderate grill. Cakes will char lightly where they come in contact with grill adding a nutty flavor to the corn. Serve immediately or reheat according to oven instruction above. Hot and Sweet Pepper Relish is an ideal accompaniment. If you enjoy this blog, please pass it along to friends and family. To subscribe, they can just click here.